According to a March 9 story in the Wall Street Journal, The U.S. Department of Justice is considering suing Apple and five large US publishers for allegedly colluding to raise the price of ebooks. At the heart of the issue, I suspect, is concern over the agency pricing model. Agency pricing allows the publisher (or the indie author) to set the retail price of their book. Although Smashwords is not a party to this potential lawsuit, I felt it was important that the DoJ investigators hear the Smashwords side of the story, because any decisions they make could have significant ramifications for our 40,000 authors and publishers, and for our retailers and customers. Yesterday I had an hour-long conference call with the DoJ. My goal was to express why I think it's critically important that the DoJ not take any actions to weaken or dismantle agency pricing for ebooks. Even before the DoJ investigation, I understood that detractors of the agency model believed that agency would lead to higher prices for consumers. Ever since we adopted the agency model, however, I had faith that in a free market ecosystem where the supply of product (ebooks) exceeds the demand, that suppliers (authors and publishers) would use price as a competitive tool, and this would naturally lead to lower prices. I preparation for the DoJ call, I decided to dig up the data to prove whether my pie-in-the-sky supply-and-demand hunch was correct or incorrect. I asked Henry on our engineering team to sift through our log files to reconstruct as much pricing data as possible regarding our books at the Apple iBookstore. 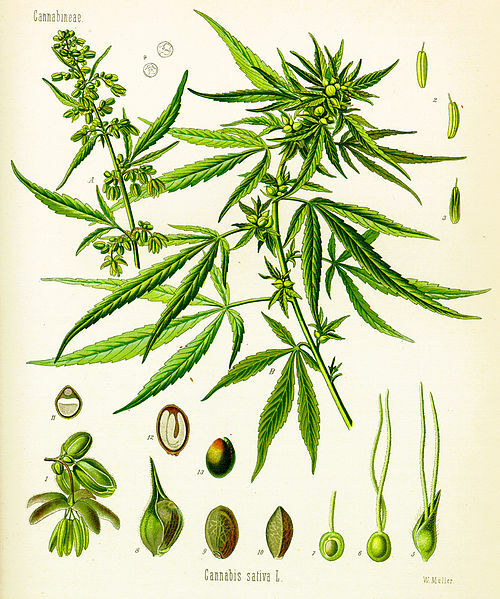 We shared hard data with the DoJ yesterday that we've never shared with anyone. I'll share this data with you now. 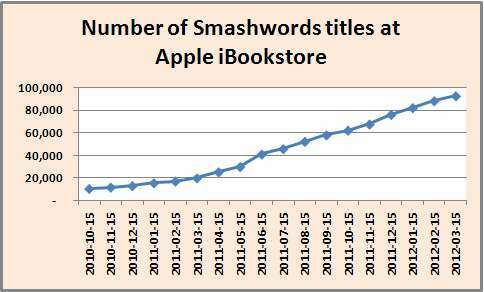 As background, Smashwords is one of several authorized aggregators supplying ebooks to the Apple iBookstore. On day one of the iPad's launch, we had about 2,200 books in the iBookstore, and our catalog there has grown steadily ever since. Henry was able to assemble a complete data set going back to October 2010. 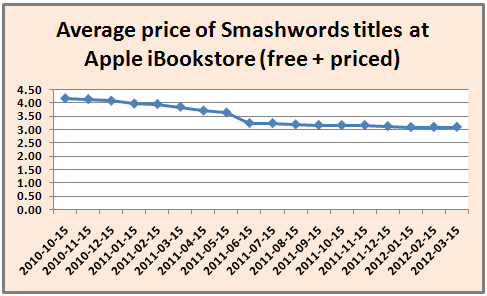 We created once-a-month snapshots of the Smashwords catalog at the Apple iBookstore between October 2010 and March 2012. 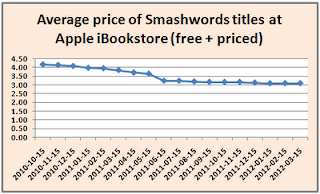 Our data captures the average price of our titles in the iBookstore, and the number of titles listed. I'm sharing four data sets. 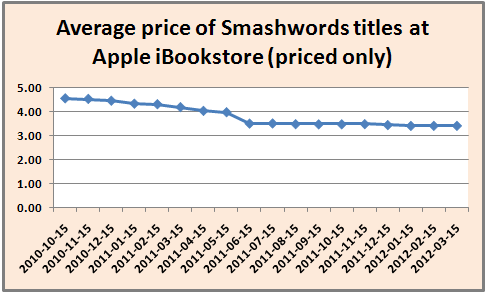 The first data set, above at left, shows the number of Smashwords titles for sale in the Apple iBookstore. As you can see, the numbers have grown steadily. I'm not aware of any other agency pricing study that worked against such a large body of data. In the next data set, we plotted the percentage of books priced at FREE by our authors and publishers. As you can see from the chart, the number grew from 8.45% in October 2010 to 9.60% this month. Why would authors and publishers give away complete books when they have the power to price at a price? The reason is because FREE is a powerful marketing tool for platform building, and for introducing new readers to an author's backlist. This data indicates a slow but steady increase in the adoption of FREE. For you statistics geeks out there, the data represents a statistically significant trend with a tau of 0.516 and a 2-sided pvalue of .00313. For you non-stat-geeks, a positive tau number indicates an upward sloping trend, and the pvalue represents the statistical odds that the trend is invalid. A 2-sided pvalue of .00313 indicates that the odds of this trend not being statistically significant is only 3 in 1,000. In the next chart, I aggregate all books, both FREE books and priced books, to calculate the average price of the books in the catalog. The downward sloping trend is pronounced. The tau is -.948, indicating a downward trend, and the 2-sided pvalue is .000000049141. So, if I'm counting my zeros correctly, that's less than a 1 in 100 million chance that this trend is not statistically significant. In plain English, we've seen the average price of books in our catalog drop from $4.16 in October 2010 to $2.97 today. In the next data set, we removed the free titles to identify the true average price for priced books in our catalog at Apple. This statistically significant data set carries a tau of -0.908 and a 2-sided pvalue of 0.00000017217. This confirms that even if you remove FREE books, the average price of priced books is declining. The tau indicates 1 in one million chance that the indicated trend is incorrect. In plain English, the average prices have dropped 25% from $4.55 in October 2010 to $3.41 today. Back in 2009, I blogged at the Huffington Post that the time had come for publishers to price ebooks at $4.00. That day arrived for Smashwords authors and publishers a year ago. The $3.41 is a really interesting number, for a couple reasons: 1) It shows that authors and publishers, left to their own free will, are pricing their books lower in this highly competitive market. Sure, they could all try to fleece customers by pricing their books at $29.99, but customers won't let them. 2) $3.41 is remarkably close to the average price paid for Smashwords books purchased at Barnes & Noble during the last 30 days. The B&N number: $3.16. 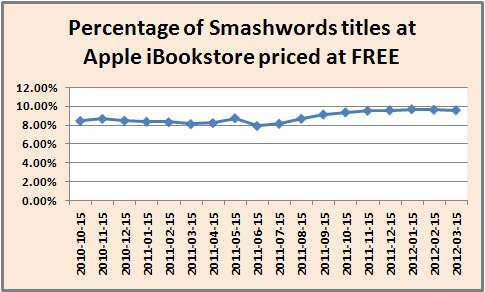 I looked at every Smashwords book sold at Barnes & Noble between February 28 and March 27, then calculated the average price. This means Smashwords authors are pricing their books close to what customers want to pay. The median price (represents the midpoint, where an equal number of books sold at lower prices and and equal number sold at higher prices) was $2.99. The weighted average price (all priced book sales divided by number of units purchased) was $2.59. We had a good conversation with the DoJ. They were very interested to learn about our business, and learn about the underlying dynamics of the retail distribution ecosystem from the perspective of indie authors and small publishers. 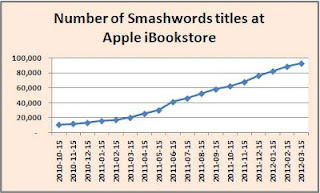 I explained how when Smashwords first began distributing ebooks to retailers in 2009, our retailer contracts were under the traditional wholesale model. After Apple introduced the agency model in early 2010, we found ourselves managing dual, incompatible pricing systems. Apple priced at agency, and our other retailers continued to discount. As I explained to the DoJ, Apple was aware that our other retailers were underpricing them, not just because we were juggling wholesale and agency, but because Apple prices in $.99 tiers. As we explained to Apple two years ago and to the DoJ yesterday, if a Smashwords author priced a book at $1.25, we'd bump the price at Apple up to $1.99 rather than price lower than what the author wanted. The DoJ asked me if Apple ever balked at the knowledge that other retailers were selling our same books for less, and my answer was no. 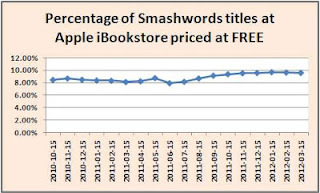 Not once in our two year relationship with Apple have they ever complained about a Smashwords-distributed title priced lower at one of their competitors. They've never price-matched any of our books if they found it lower elsewhere. I really don't think they care. For our other large retailers - Barnes & Noble, Sony and Kobo - I can think of less than five instances combined where any of them tried to price-match books because they found them priced lower elsewhere. There's only one retailer that has made it a practice to strictly enforce most-favored-nation pricing upon its authors and publishers, and they're the retailer that forced us to move all of our wholesale retailers to the agency model. As I mentioned in my initial blog post here, our move to agency in 2010 was necessitated by Amazon's automated price matching. At the time, when Sony or B&N discounted a $2.99 book by a mere 5%, Amazon price-matched the book which dropped the author from a 70% royalty rate at Amazon to 35% (Some time after October 2010, I believe Amazon stopped dropping the royalty rate upon price-matching). At the time, our bestselling authors were understandably upset, because the downgrade was costing some of them thousands of dollars in lost income. It caused some of them to remove their books from all retailers except Amazon out of fear of such punishment. Keep in mind, in mid 2010, Amazon controlled 80-90% of the US ebook market, so such policies put authors in a tough bind. In mid-2010, with our authors angry over the discounting, and with them removing books from distribution (as a distributor, we care about this on multiple levels! ), we started asking our retailers to move us to agency terms so our authors could control their pricing. At first, they all said no. None of them were fans of the agency model at that time. I think all of them felt as if the model had been shoved down their throats by the ultimatums of the Big 5 publishers (who viewed Apple and its agency model as their white knight counterbalance to Amazon). In November 2010, Kobo moved us to agency, and then the next month Barnes & Noble and Sony gave us agency terms as well. I think they all moved us to agency because they realized that their discounting was causing indie authors to remove their books and sell only on Amazon. Agency puts the authors and publishers in control over their retail price and their promotions. This gives authors and publishers the freedom to coordinate promotions across all retailers for reasons decided by the author or publisher. Publishers earn 60-70% of the retail list price as their earnings, vs. 35-50% under the traditional wholesale pricing model. This gives authors and publishers the freedom (should they choose to exercise it) to price their books lower, yet still earn the same or more income from the sale of each unit. This allows our authors to compete more effectively against the books of Big 6 publishers, who price their books on the high end. Lower prices make books more affordable and more accessible to more potential customers, leading to a virtuous cycle of higher unit sales at higher profit levels which leads to more earnings for our authors and publishers. Agency provides our retailer partners a fair, predictable commission of 30%. These retailers are investing millions of dollars - sometimes hundreds of millions of dollars - to attract more readers to more books. They earn every penny. 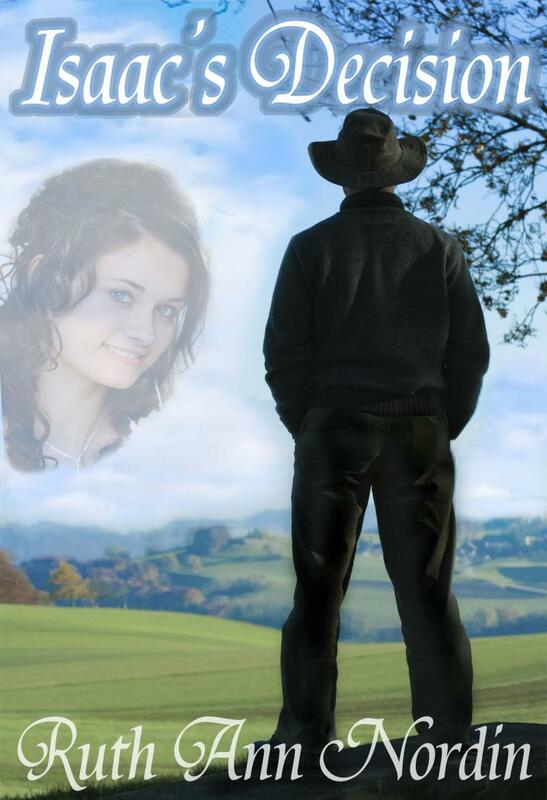 We want them all to build profitable businesses selling indie ebooks. Agency creates a level playing field for all ebook retailers. It prevents deep-pocketed retailers or device-makers from using predatory pricing practices to sell books at below cost in an attempt to bleed their competitors' finances dry, or in attempt to snuff out new competitors before smaller startups gain a foothold in the market. Agency forces retailers to compete on customer experience rather than price. Retailers who win will be those who do the best job of attracting customers to their store, and who offer the best algorithms to match readers with books they'll enjoy reading. 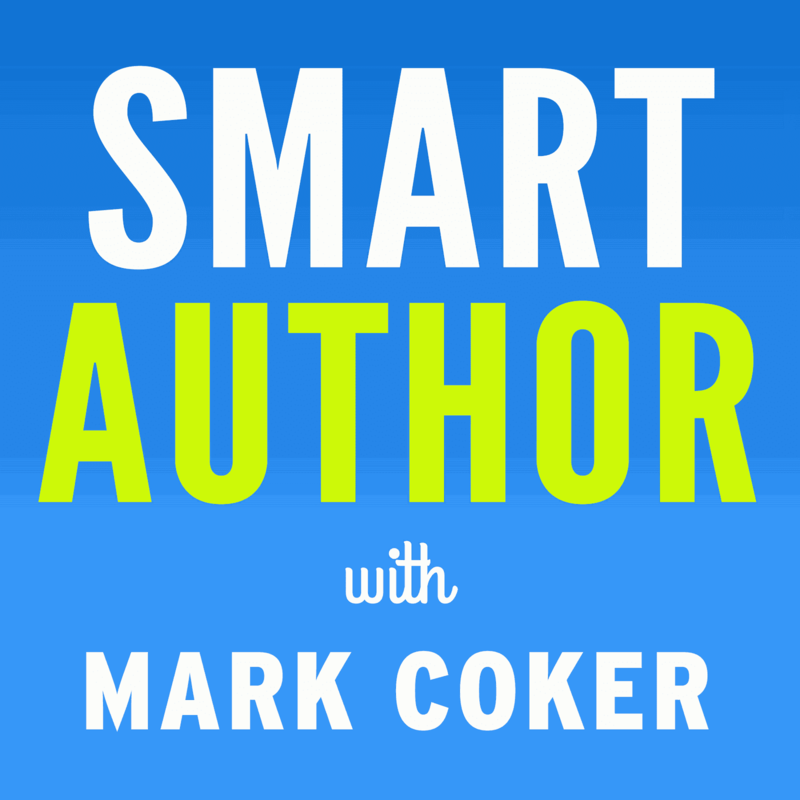 Agency forces authors and publishers to be wholly accountable to their customers. If the author or publisher prices their book too high, the market will respond by purchasing lower cost alternatives. As I explained to the DoJ, I think it's fallacy to believe that agency pricing leads to higher prices. That's like blaming cars for drunk driving accidents. The driver behind the wheel is responsible. If the Big 6 publishers are pricing their books too high (and I think they are), blame the publishers. It's also fallacy to believe that somehow the wholesale pricing model is the savior and enabler of low prices. Under the wholesale model, the publisher has always set the price at which they'll sell the book to the bookstore, typically a 50% discount to the suggested list price. The $30 front list hardcover you purchase earns the publisher $15, or less. If the publisher decides they need to earn $18.00 on each copy sold, they'll set the suggested list price to $36.00. If you agree that under normal circumstances, most retailers will not consistently sell all their books at below cost, then it's reasonable to conclude that even under wholesale, publishers already control the minimum price all customers, on average, will pay. It's worth noting that when the Big 5 publishers moved to agency, many of them started earning less per book than they had previously earned under the wholesale model. Pricing control was more important to them. Indie author and publisher "royalty rates" (earnings) would drop to 35-50% of the retail price. Retailers would discount ebooks, and customers would begin migrating to retailers with the lowest prices. In the online realm, the cheaper book is only a click away. Online price checking web sites and apps make it easy for customers to always find the lowest price. 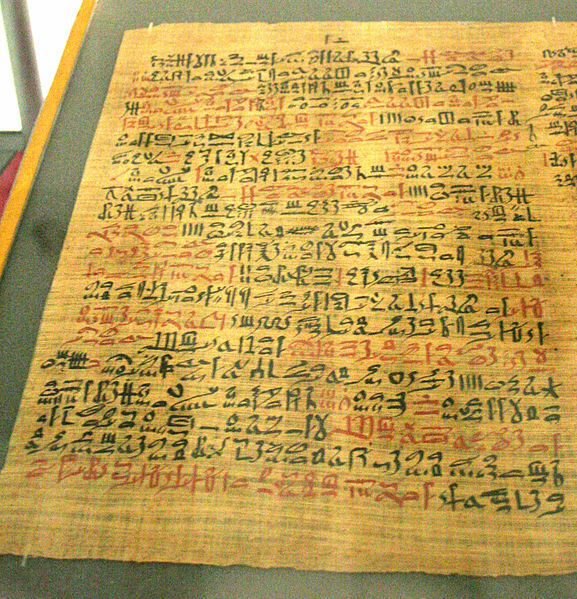 Authors and publishers, in an attempt to recoup lost earnings, would at first increase prices. For example, if it's important to a Smashwords author that they earn $3.00 per copy sold, under agency they'd price the book at $5.00. Under wholesale, they'd need to price the book at $7.00, 40% higher. Yes, a return to wholesale could increase prices for customers. Barnes & Noble, which now controls about 28% of the US market, would probably run out of cash and suffer the safe fate as Borders. Smaller independent ebook retailers such as the Diesel eBook Store, BooksOnBoard and others, would be probably be forced out of business. 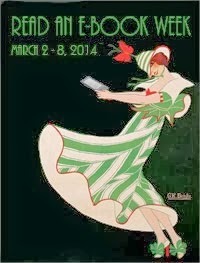 Formation of new ebook retailers, both here in the US and internationally, would dry up to a trickle, further limiting the number of companies in the business of promoting reading. With less competition, retailers would stop discounting, and prices would rise as retailers capture the full 50% margin enabled by the wholesale model. With retailing power consolidated in the hands of one or two powerful retailers, authors and publishers could lose control over their distribution options and could be forced to make concessions on royalty rates, or forced to pay co-op dollars or listing fees. I'm not suggesting that any of these retailers harbor nefarious intentions. They're simply trying maximize profit on behalf of their shareholders within the environments they operate. As much as I love our friends at Apple, and as much as I hope to be great friends someday with Amazon, I don't want there to be only two bookstores standing when the post-DoJ dust settles. That would be horrible for everyone, and I don't think it would even be good for Apple and Amazon. I think if those of us - including the DoJ, authors, publishers, retailers, distributors, readers - who have the power to promote policies and practices that lead to more bookstores and more reading, we have an obligation to do the right thing. I believe agency will lead to more reading, and wholesale will lead to less. Ultimately, regardless of pricing model, customers will decide what they will and will not pay. Here's the big question: Who should decide what customers should pay? Proponents of the wholesale model believe that publishers make poor pricing decisions, and retailers make smarter decisions. If we're talking about big publishers, I agree with the retailers. Big publishers are pricing their books too high. If we're talking about the indie authors and small presses, I think indies are more savvy about pricing than big publishers. The data above supports this. They're closer to their customers. With nearly 100,000 Smashwords books to choose from at Barnes & Noble, customers are voting for $2.99 as the median price and our books are priced very near that. Are retailers better at pricing than indie authors? My guess is yes, simply because retailers have real-time access to store-wide data. But this gap in intelligence is rapidly decreasing. 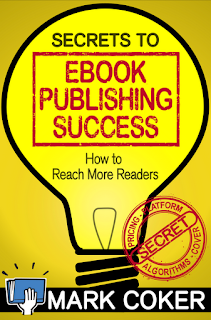 Indie authors are getting faster access to information, and there's even greater opportunity ahead for distributors such as Smashwords to start sharing more information with both authors and our retail partners. Such information sharing will help better align the interests of authors and retailers, and the end result will be pricing that is more responsive to the needs of customers. In the end, I think authors and publishers should have the freedom to decide their pricing. 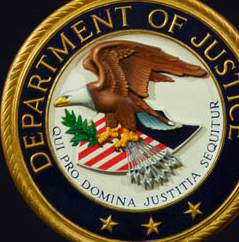 I have no idea how the DoJ will lean in their rumored lawsuit. I also don't know the negotiation plans of the publishers and Apple. The DoJ declined to share any details of their investigation with me. I trust now that whatever decision the DoJ makes, they'll make it with the full knowledge of how it will impact indie authors. As I expressed to the DoJ, indies are the future of publishing. I met with PayPal at their offices yesterday in San Jose. They outlined their proposed policy changes for me. I was impressed. If you haven't followed the Paypal censorship saga, you can see how the campaign developed by reading my email dispatches to Smashwords authors, publishers and customers. 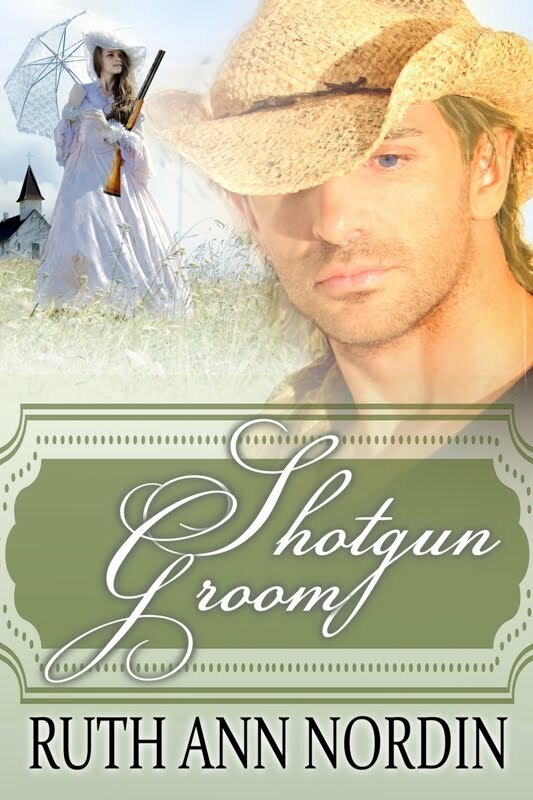 They're archived in the Smashwords Press Room (see PayPal #1, #2, #3, #4, #5). 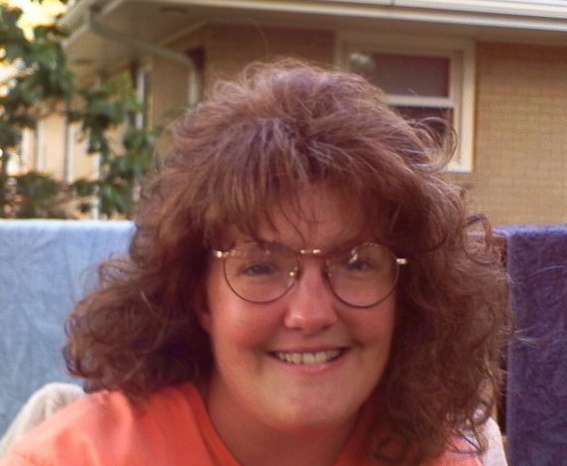 When I received the first email from PayPal February 18 with the ultimatum to remove certain erotica content or face loss of PayPal services at Smashwords, my first inclination was to try to limit the damage so we could protect mainstream erotica from further censorship incursion. Thanks to the outpouring of opposition to these policies, I saw an opportunity to make PayPal our partner in a greater campaign to protect all legal fiction from censorship. Credit for this breakthrough goes to the indie author community who made phone calls, wrote letters and emails, blogged and tweeted; bloggers who raised visibility of the issue; advocacy groups such as the Electronic Frontier Foundation (EFF), The American Booksellers Foundation for Free Expression (ABFFE) and the National Coalition Against Censorship (NCAC) who were the first to stand up for our authors; mainstream media who raised visibility of the story to greater levels; and last but not least, PayPal. PayPal worked with us in the spirit of partnership to understand the issues, understand Smashwords and how we represent a new model for publishing outside the traditional gatekeeping system, and to understand that fiction is fiction and literary merit should be determined by readers. 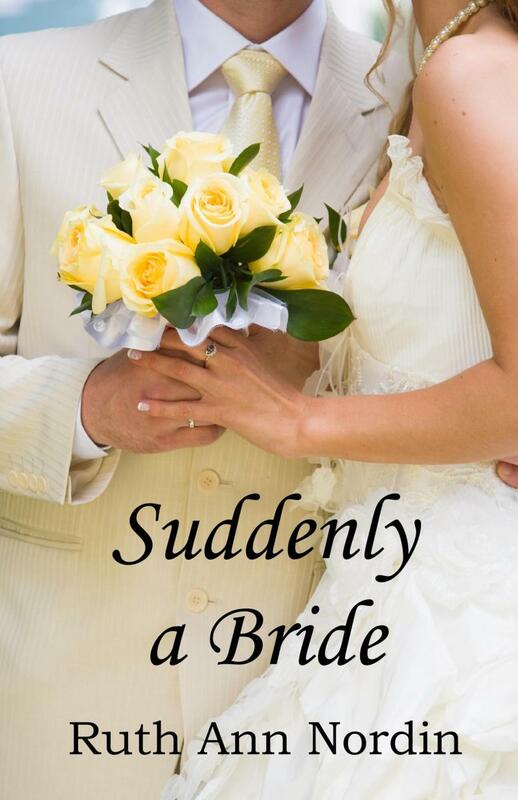 I'm sending out an email today to all Smashwords authors and publishers with more details and thanks. 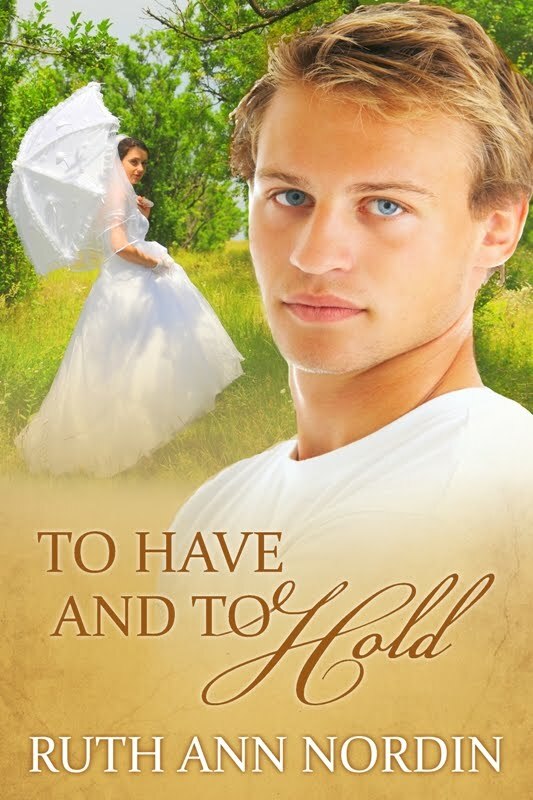 An archived version is in the Smashwords press room here.